Modern medicine is a thing of beauty. The skilled hands of doctors and surgeons, exercising their commitment to preserving the health of those in need, are capable of performing miracles. Enhancing their innate talents through the use of state-of-the-art technology has further allowed health care professionals to deliver top-notch care almost anywhere in the world. Healthcare practitioners of every discipline often have many tasks to carry out when tending to patients, many of which require frequent position changes. That’s why adjustable monitor mounts have become just as indispensible to the healthcare industry as stethoscopes. Cotytech’s line of monitor mounts built specifically for the healthcare industry, are preferred for a number of reasons. Built from durable materials and featuring several points of articulation for the ultimate in viewing accessibility, these mounts employ a clean white aesthetic that is common to most healthcare settings. Solid aluminum framework is covered with a plastic exterior that’s easy to keep clean and disinfect. Mounts are compatible with varying sizes of screens and are dually compatible with both PC and Mac products. There’s even the option for installation into the ceiling (additional accessory required), should it be preferred over typical wall installation. The highly versatile nature of our mounts has led many to question whether or not they can be used for securing other devices, and the answer is a resounding yes! You’re going to need this accessory. Known as a VESA bracket, it’s compatible with any of our mounting products, even those not created exclusively for the medical industry. It’s imperative that you own this, as without it, camera installation simply won’t be possible. 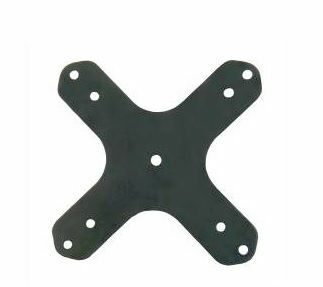 The VESA bracket has an “X” design, with each end containing a pair of holes. Simply screw the bracket into the mounting arm through those holes (it doesn’t matter whether you opt for the inner or outer holes). In the center of the VESA bracket is a single threaded hole, and that’s where you’re going to put your camera. Fasten it into place, and you’re all done! Just as easy the VESA bracket installs, it also un-installs. Should you find yourself in need of a mount for your LCD monitor one moment and a camera the next, all you’ll require is a screw driver and a few moments of time. Those talented individuals who dedicate their lives to the betterment of our own, often have to work under extreme pressure and the most challenging of situations. Having access to the latest technology has improved patient outcomes. Our goal at Cotytech is to deliver as broad a range of solutions for every industry, and we’re proud to be able to support the healthcare profession with multi-purpose mounts designed to improve user efficiency and comfort.